Healthful Kids’ Meals and Locally Sourced Ingredients are the hottest restaurant menu trends we can expect to see in 2012 - well in the US officially anyhow! The annual National Restaurant Association survey of American Culinary Federation member chefs (more than 1,800) revealed some interesting restaurant trends that are totally applicable in the Australian culinary environment. As you look at the top 20 trends you’ll notice the recurring themes amongst the top 10 - healthy options for kids and locally sourced ingredients. In Australia I think we acknowledge where our food comes from really well – definitely in some of the better restaurants. I love it that many places take such pride in telling you which local farmers and food producers the food comes from. I think we have a long way to go, but at least we are seeing this also with our supermarkets! Whole grain items in kids’ meals. What was also really cool was that technology rated a mention too, though there was a bit of debate about the TOP trend! Basically technology trends involve social media and smart phone apps, tablets (ie iPads for menus and wine lists) and wireless pay at the table options. I’m thinking there are no real surprises there? What WAS really interesting though was 61% of chefs said they would consider launching a food truck as an entrepreneurial business venture. I wonder if that would be true here in Australia? 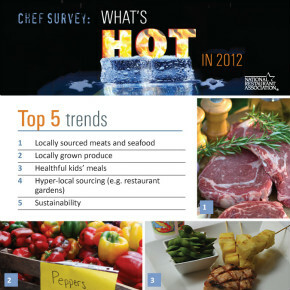 For complete What’s Hot in 2012 survey results visit www.restaurant.org/foodtrends.